NOAA Ship Okeanos Explorer is the only federal vessel dedicated to exploring our largely unknown ocean for the purpose of discovery and the advancement of knowledge about the deep ocean. The ship is operated by the NOAA Commissioned Officer Corps and civilians as part of NOAA's fleet managed by NOAA's Office of Marine and Aviation Operations. Mission equipment is operated by NOAA's Office of Ocean Exploration and Research in partnership with the Global Foundation for Ocean Exploration . 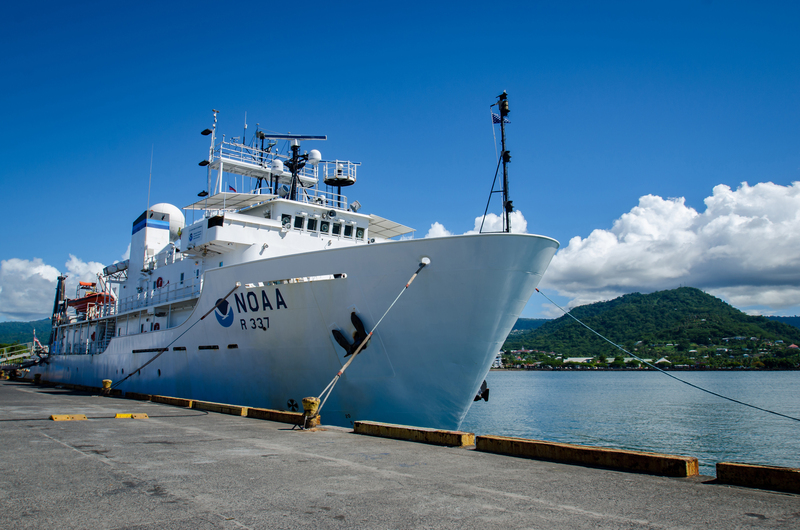 NOAA Ship Okeanos Explorer docked at the pier at the Port of Apia in Samoa prior to the start of the the Discovering the Deep: Exploring Remote Pacific Marine Protected Areas expedition. Image courtesy of the NOAA Office of Ocean Exploration and Research, Discovering the Deep: Exploring Remote Pacific MPAs. Download larger version (jpg, 6.6 MB). 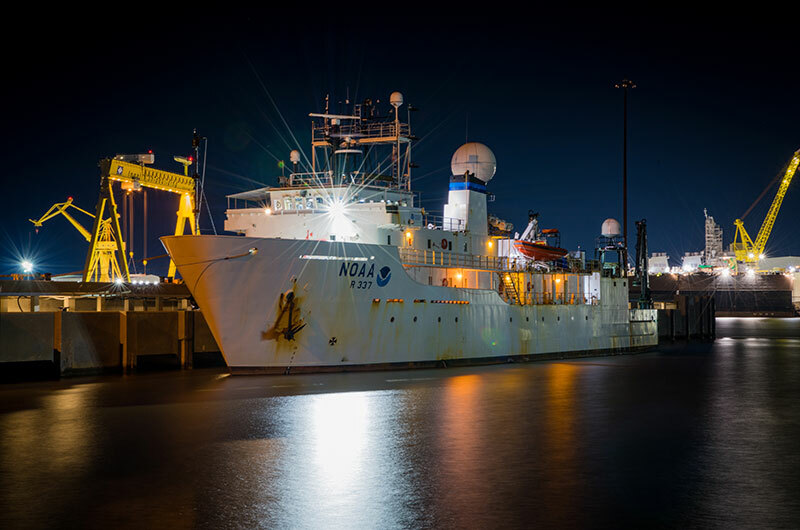 NOAA Ship Okeanos Explorer in Pascagoula, Mississippi, at night during the Gulf of Mexico 2018 expedition. Image courtesy of Caitlin Bailey, GFOE, Gulf of Mexico 2018. Download larger version (jpg, 5.5 MB). Unlike many other ocean expeditions supported by NOAA, most of the scientists participating in Okeanos Explorer missions remain on shore, thanks to telepresence technology. The ship is equipped with a high-bandwidth satellite communications system capable of transmitting mapping and oceanographic data and real-time, high-definition video feeds from the ROV through network connections to scientists on shore. Using this technology, a theoretically unlimited number of scientists standing watches at a series of Exploration Command Centers ashore (or at the comfort of their own desks) are able to add their expertise to missions no matter where in the world the ship, or the scientists, are located. Simultaneously, public viewers can tune in online to watch and listen to ongoing expeditions, bringing the excitement of ocean exploration and discoveries into classrooms, newsrooms, and homes—to anyone who has an Internet connection and a passion for learning about the ocean. Video courtesy of the NOAA Office of Ocean Exploration and Research, Gulf of Mexico 2018. Download larger version (mp4, 151.2 MB). Since being commissioned in 2008, NOAA Ship Okeanos Explorer has traveled the globe, exploring everywhere from the Indonesian “Coral Triangle Region” and benthic environments in the Galápagos, to areas in the Gulf of Mexico, canyons and seamounts off the Northeast U.S. Atlantic coast, and marine protected areas within the Pacific. By collecting baseline information in never-before-explored areas, Okeanos expeditions further our knowledge while setting the stage for future in-depth exploration activities. Prior to being obtained by NOAA in 2004 and commissioned in 2008, the Okeanos Explorer operated as the U.S. Naval Ship Capable, a T-AGOS class vessel. The ship was named by students from Illinois’ Woodstock High School in a nationwide ship-naming contest; in ancient Greek cosmology, Okeanos was the river/ocean that encircled the world. The ship is homeported in North Kingstown, Rhode Island, and conducts operations around the globe. For additional information, this document provides a more-detailed and technical overview of the ship's capabilities.